I finely got all of the dinosaur minis that I need for Tomb of Annihilation. The hardest thing to do was to get the models in the correct size for playing on a one inch grid. I was determined to use the sizes they have in the monster stats. The only one that I couldn’t find at the proper scale was a Hadrosaurus. Allosaurus – Painted Toy that I mounted onto a 2″ base. Allosaurus, Young – Painted Toy that I mounted onto a 1″ base. Ankylosaurus – Painted Toy that I mounted onto a 3″ base. Brontosaurus – Toy that I painted and mounted onto a 4″ base. Deinonychus – Prepainted mini by HeroClix. Dimetrodon – Toy that I re-painted and mounted onto a 2″ base. This should have been on a 1″ base, but only smaller one that I could find didn’t look as good. Plesiosaurus – Toy that I re-painted and mounted onto a 2″ base. Pteranodon – Toy that I re-painted and mounted onto a 1″ base. Stegosaurus – Painted Toy that I mounted onto a 3″ base. Triceratops – Toy that I painted and mounted onto a 3″ base. Tyrannosaurus Rex – Toy that I re-painted and mounted onto a 3″ base. Tyrannosaurus Zombie – A mini by Dungeons & Dragons – Collector’s Series Miniatures that I assembled and painted. Velociraptor – A pre-painted mini by WizKids. For all of the others, I didn’t keep any records. I found them at various local stores. 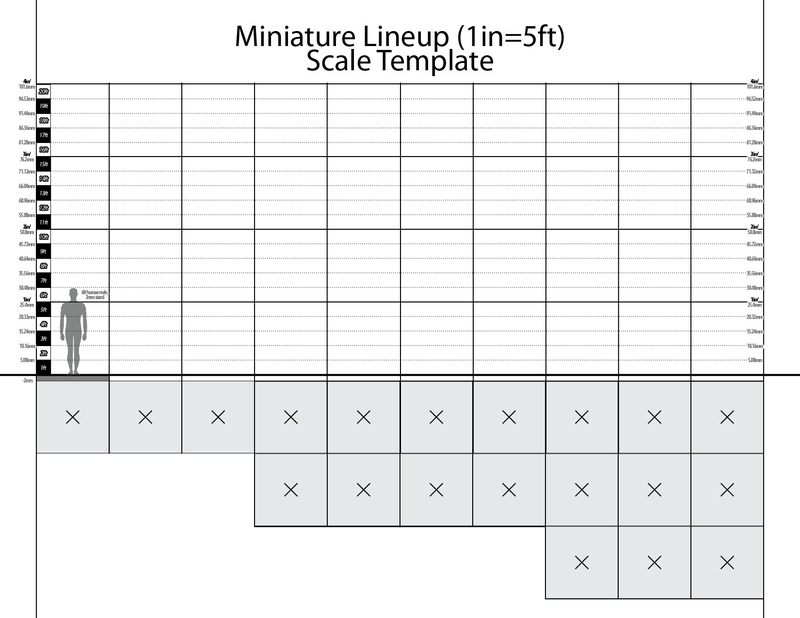 Thanks to Zee Parks for his “Miniature Lineup (1in=5ft) Scale Template“. Very nice collection! The hard work to put all of that together will sure be appreciated by your players. Those look amazing. I totally want to run a sub-tropical game e.g. Tomb of Annihilation just to run a bunch of dinosaurs! If you just want to run a bunch of dinosaurs, you might also want to look at “Isle of Dread”, it has lots of dinosaurs. Goodman Games is about to release a 5E conversion of this first edition module, or you might find fan converted version. Also Wizards of the Coast produced a play-testing version in 2012 before they published the final version of fifth edition.